A: A majority of our equipment includes setup and breakdown. Additional Fees apply for setup and break down of Tables and chairs. Delivery Fees always depend on the location we are delivering to and the amount of the rental. Please inquire for further explanation. Remember prices do not include sales tax. A: No. The jump should be clean when you get it. 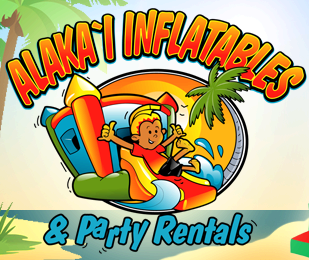 Alaka`i Inflatables & Party Rentals cleans and disinfects after every rental. A: We love setting up at parks but most parks do NOT have electricity. If you want to set up at a park, you must rent a generator. We rent generators at a reasonable cost. Also, parks usually require permits and some are first come, first serve so get your spot early in the day. A: If a balance is owed on the day of your event then we only accept Cash, Money Order or Cashiers Checks. Sorry but we do not accept Credit Cards or Personal Checks the day of your event. If paying by cash, please have exact change as our drivers do not carry cash. Also, if paying cash please get a receipt from our employee. A: Please review FAQ or check out our policies page for details. A: Yes all orders require a 40% or $100 (Whichever is greater) non refundable deposit to reserve equipment and Services. If you cancel your event 2 weeks out or more we will give you a Rain check good for a year from the cancellation date. This is only good towards a 40%/$100 deposit of a rental item of equal or greater value. If you cancel within 13 days prior to your rental, your deposit will be forfeited. If weather is an issue we will consider Rain checks on a per event basis, but cannot make any guarantees. If more than 40%/$100 is paid to reserve our equipment or services that amount will be given as a rain check as well..
A: Most of our jumps (all of our character jumps for example) are 15´x15´ which is a little bigger than many companies rent. Please note the space required for each jump (listed near the large picture) as some are VERY big and require extra space. When in doubt, measure your space to make sure it will fit. Jumps need room to be staked and they need room for the blower and can't rub against walls or trees as this may damage the jump. The sizes listed with each jump include the space needed for stakes etc. 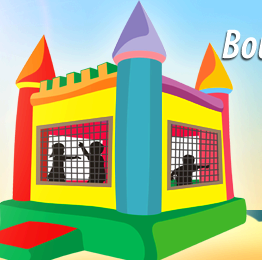 If you have stairs or a tiered backyard, please call our office to discuss options for setup.